More on Eric Kaufmann’s recent research into ‘racial self-interest’. The last one is from a survey participant, not EK; I just thought we needed some fresh air. The research starts from the assumption that ‘racial self-interest’ is distinct from racism, and that recognising this fact explains – and helps condone – some racially discriminatory behaviour. The survey then prompts participants with the information that ‘racial self-interest’ is in fact distinct from racism, and invites them to apply it to a hypothetical situation which is designed to exemplify racial self-interest. Finally, EK reads the data and concludes that ‘racial self-interest’ is distinct from racism, and that only irrational bias can account for left-wingers’ failure to acknowledge the fact. a) Linda is a bank teller. b) Linda is a bank teller and is active in the feminist movement. As a student, she was deeply concerned with issues of discrimination and social justice, and also joined the local Labour Party. Which is more probable? a) Linda is a Labour Party member, which is not the same as being a socialist. b) Linda is a socialist. In EK’s research, in other words, respondents were primed with the ‘right’ answer and duly repeated it back, in the same way that Tversky and Kahneman’s subjects were effectively primed with the ‘wrong’ answer. But this isn’t the point of the research; the point is that a minority of respondents gave the ‘wrong’ answer despite the priming – and it’s these subjects that EK is really interested in. His interest isn’t unmotivated – he clearly believes that the ‘racial self-interest’ model is in fact the right answer, as well as being the ‘right’ answer to the question as he formulated it. This, though, is something that the research as designed can’t confirm or deny; it’s assumed at the outset and assumed in the conclusion. In one focus group run as part of my ESRC-Demos research, a lady complained of the Croydon (UK) tramlink that ‘I might have been the only English person on that tram… I didn’t like it… I could have been in a foreign country’ was challenged by another participant who asked, ‘Why should that affect you that there’s minorities on the [tram]?’ The woman swiftly changed her narrative to a more acceptable, economic, form of opposition to immigration: ‘It doesn’t affect me. It, um… I’ve got grandchildren and children… I don’t think things are going to get any better or easier for them, to get work.’ In other words, economic but not ethnocultural concerns about immigration are considered legitimate subjects for public debate. This produces dishonest debate rather than a frank and rational exchange between people of all backgrounds – realising they share similar ethnic motivations and must reach an accommodation that is fair to all. But why would the detoxifying of ‘ethnocultural concerns’ be a good thing? How would the resulting ‘honest’, ‘frank and rational’ debate go? – Why should that affect you that there’s minorities on the [tram]? – Oh, racial self-interest, right. Don’t feel it so strongly myself, but if you do, well, fair enough. There isn’t that much to debate, at the end of the day: a woman in Croydon didn’t like being – or feeling – outnumbered by foreign people on a tram, and that feeling is either (a) racist and therefore not legitimate or (b) not racist and therefore legitimate. It doesn’t matter how many people might frankly and honestly admit to racist sentiments, if encouraged to do so; if those sentiments are racist, they shouldn’t be publicly legitimated. Really, this is just “you can’t say that any more” in more sophisticated language. The notion of racial self-interest also carries the unwelcome implication that there are such things as races which can have self-interest. EK has gestured towards the classic sociologist’s answer to this kind of question – that if people believe things are real and act accordingly, they are real in their consequences – but in this case it won’t really do. To believe in ethnic groups – even to believe in one’s own – is not necessarily to believe in ethnic group interests. If people believe that the Black British identity, the Muslim identity, the Welsh-speaking identity (etc) are real and act accordingly, no harm necessarily follows: everyone is free to maintain, develop and celebrate the identities which they feel to be theirs, and to seek out like-minded people to support them in doing so. No harm necessarily follows, up to the point where they start believing that identities like these have interests and are in competition. It’s this additional belief that leads people to act hatefully to people of the ‘wrong’ group, and it’s this belief that we generally call racism. The one situation where ethnic group interests can become a reality, ironically, is when the ethnic group is under threat – which may be the end result of racism. Where a particular group is threatened with extinction, or its existence is denied, or its identity is treated with contempt, all members of that group have a genuine common interest in group preservation and self-assertion. But this interest is met by physical and cultural survival; there is no intrinsic interest in group expansion, except so far as necessary to assure bare survival. Moreover, the group interest is secondary; it is derivative of the fundamental individual rights which everyone has, to life and to self-actualization through culture. If those needs are met in ways that don’t perpetuate the group, the group has no independent interest in survival. There may be a thousand nominal Muggletonians in Britain, but if none of them feels that being a Muggletonian is an important part of their identity, the extinction of Muggletonianism is inevitable and is not to be regretted (except by historians). The group extinction scenario clearly has no relevance to the position of Whites in Britain and the USA. EK invokes it nevertheless, noting that Zoroastrians frown on exogamy for just this reason. A similar logic presumably underlies an otherwise puzzling formulation, when EK argues that if someone objects to their child’s chosen partner on the grounds that the union would “defile their race’s purity”, this is racism, but that if the motive is “to preserve the vitality” of their ethnic group, this is “group-interested behaviour”. (Got that, everyone? Purity bad, vitality good.) EK seems to wish to help himself to the genuine issues faced by groups which are so small as to be in danger of extinction; he manages it by blurring the difference between genuinely preserving an ethnic group from extinction and preserving its “vitality”, or believing one is doing so. But the threat to the survival of Zoroastrianism is a reality, not merely something that becomes real by being acted on. If you act as if being English is ‘a thing’, you’re creating the social reality of being English. If you act as if the English are under threat of extinction, you’re creating social reality based on assumptions which you know to be false – in other words, you’re acting in bad faith. At the end of the report we still have no clue as to why EK believes that ‘racial self-interest’ is a valid model, to the point that people who fail to believe in it can be labelled as biased and irrational. It’s clearly not because he believes that discrete human ‘races’ actually exist, in the sense that distinguishable noble gases or species of lizard exist. Certainly, many people believe in and identify with ethnic groups (defined in a variety of different ways). And certainly, a lot of people believe that ethnic groups have interests – at least, that their ethnic group does – and that the pursuit of these interests is entirely distinct from racism and should not be given such a pejorative label. But it’s not the role of the social scientist to give scientific credibility to widely-held errors – least of all errors as dangerous as this one is. Next: but what about multiculturalism, eh? Before I get on to Scotland, here’s another way of looking at the figures in the last post. Judged over their whole careers as leader, Labour’s three biggest vote-winners – in fact, their only vote-winners – are Neil Kinnock, Ed Miliband and James Callaghan, in descending order; the three biggest vote-losers are Hugh Gaitskell, Tony Blair and Michael Foot, whose stewardship of the party saw it lose one, two and three million votes respectively. (Honourable mention to Gordon Brown, in a close fourth place with a net loss of over 900,000 votes.) Tony Blair, like Harold Wilson before him, drove the party’s vote up and then drove it right down again. Wilson became leader after a 12.2 million-vote defeat and resigned after winning an election with 11.5 million votes (a post-war low), paving the way for the defeat of 1979; Blair took over after an 11.6 million-vote defeat and resigned after winning an election with 9.6 million votes (from a substantially larger electorate), making the defeat of 2010 all but inevitable. A lot of recent commentary has bracketed Ed Miliband with Michael Foot, as left-wing leaders who presided over humiliating defeats (never mind the fact that Foot’s defeat was brought about by leading members of his own party). 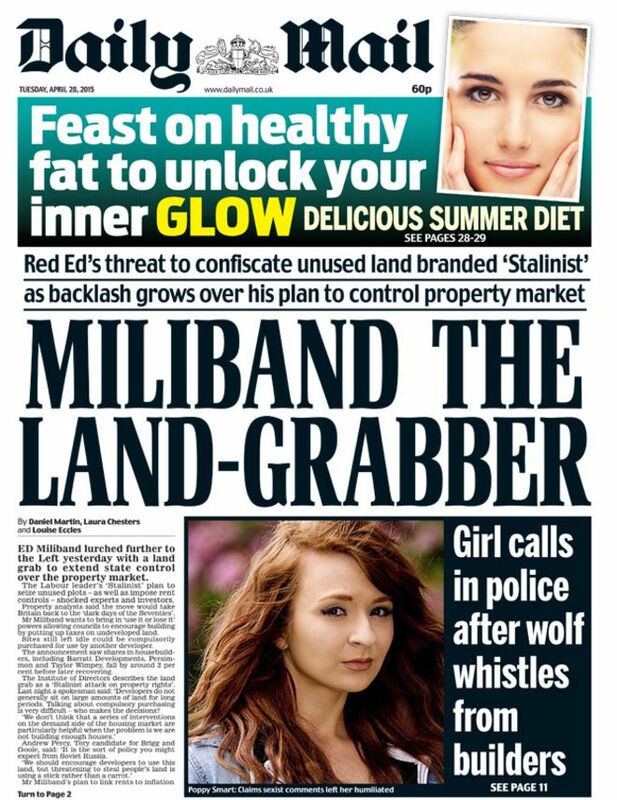 But the answer to the quiz question “which Labour leader had the second largest loss of votes?” isn’t Ed Miliband. Winning elections by hook or by crook is handy, but it makes more sense to judge success for a party – or party leader – in terms of numbers of votes; there are fewer factors involved, and a lot fewer factors outside the party’s control. 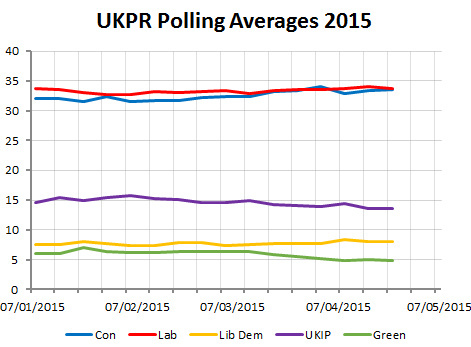 And on that metric Ed Miliband really doesn’t look that bad – particularly if you bring Scotland in. Let’s suppose – as a lot of commentary does – that the SNP landslide was, in effect, just that: an unstoppable natural phenomenon, which couldn’t be predicted precisely but was bound to happen sooner or later. (I don’t think this is correct, but we’ll stick with it for the sake of argument.) Overall, the difference between Labour’s 2010 and 2015 performances (discounting by-elections) was a gain of 740,000 votes and a loss of 26 seats, but if we separate out the constituent nations of Great Britain the figures look a bit different. Labour put on over a million votes in England – in an election where the Green vote also increased by a million. (Some of the latter will have been former Lib Dems, but not all of them.) As you can see from the list above, this is a kind of increase in votes which Labour has only managed a handful of times since 1945 – once under Blair, once under Attlee and twice under Kinnock. Another interesting perspective shift is imagining what would have happened if somebody had kicked the crucial pebble ten years earlier, so that the landslide election was the one in 2005, not 2015. Take another 330,000 votes and 40 seats from Labour; suddenly Labour are nine seats short, and questions are being asked about Tony Blair’s ability to lose the party 1,500,000 votes, 87 seats and its majority. That last part is a counter-factual – and, as it goes, I don’t think the SNP landslide was either inevitable or unpredictable, let alone that it could have happened as early as 2005. But the 2015 gain of a million votes in England is real. Doubtless much of this was a one-off gain from a minor-party squeeze – just as much of the vote loss in 1983 derived from a one-off minor-party surge – but the numbers do suggest that Ed Miliband’s leadership was doing something right, at least in England: something which should be built on rather than being repudiated. And there’s certainly nothing here to suggest that Blairism is a proven vote-winning strategy. If anything it’s a proven vote-losing strategy, which also wins elections – but only if the party’s support is already strong enough to absorb the loss of votes. Next: the Scottish play (and surprise everyone). Since about 1974, the two-party system established after 1945 has been gradually unravelling. (This means, of course, that the period of unchallenged two-party stasis is actually shorter than the period since it ended. Not only does nothing last forever in the British House of Commons, nothing (since Victoria) has lasted longer than about 40 years: first Whigs and Tories, then Liberals and Conservatives, then National Governments for most of the period from 1918 to 1945, then the Labour/Conservative duopoly, and then the unravelling begins.) 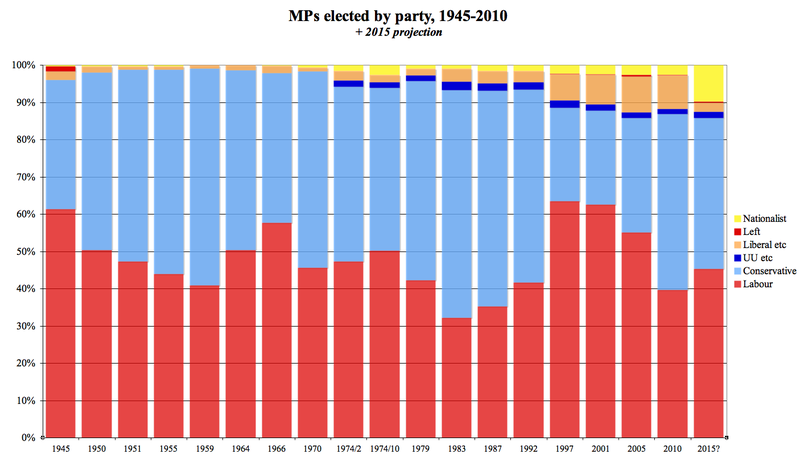 For much of the period between 1945 and 1974 third-party representation was minimal: in the 1964 House of Commons there were nine third-party MPs in total, meaning that Labour had an overall majority despite having only thirteen more seats than the Conservatives. That hasn’t been the case for a long time; throughout the Thatcher and Blair years, despite the unchallenged dominance of their respective parties, the number of seats not available to the two main parties has steadily increased. There look like being around 90 third-, fourth- and nth-party MPs in the next Parliament, meaning that the gap between the two main parties needs to be that much bigger for either to gain an overall majority. The number of seats the winning party would needs is still the same – formally, half the seats in the Commons plus one, or 326; the difference is that, to achieve an overall majority, the first party now needs a much larger lead over the second party, which must win no more than 234 seats. Instead of the two parties splitting the lion’s share of the seats 52%/48% (as happened in 1951), the split thus needs to be at least 58%/42% in favour of the largest party: any less and, as in 2010 (54%/46%), there is no overall majority. Prior to 2010, of course, this was not an issue. 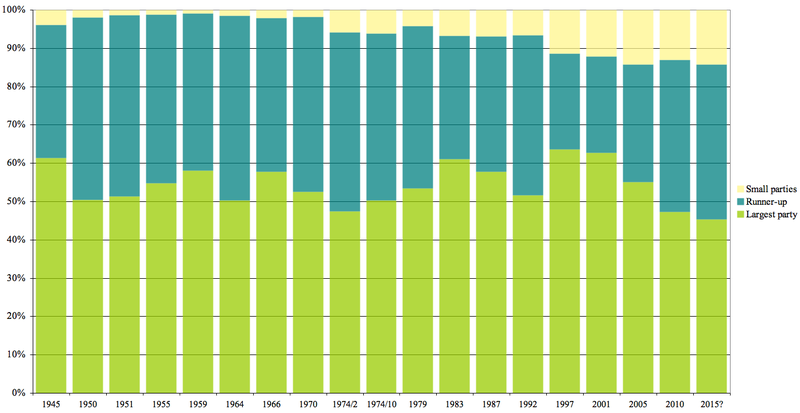 Curiously, in the same period that the minor-party bloc was growing, its effects were masked by a series of huge parliamentary majorities: the governing party never accounted for as many as 60% of the first two parties’ MPs from 1950 to 1979, but majorities on this scale were achieved in five of the next six elections, two under Thatcher and three under Blair. 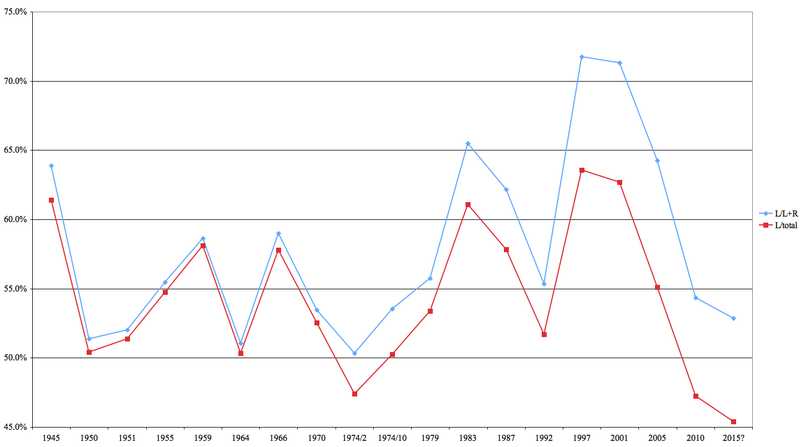 The scale of the split between the first two parties in 2010 – 306 to 258 – was more typical of election results in the 1950s and 1960s; something similar will almost certainly be seen this year. This raises the issue of coalitions and alliances, deals and understandings. There are, of course, many ways to form a coalition and just as many ways to justify choices of coalition partner. Nick Clegg has declared that the Lib Dems would only work with the party given the biggest ‘mandate’ in the election – and that a government formed on any other basis would lack legitimacy and be unable to function. (He has subsequently retreated from the assertion about legitimacy.) This echoes a line being run by the right-wing press, to the effect that the party with the most seats will be the rightful winner of the election, whether or not another party can put together a more durable parliamentary majority. However, there is no constitutional justification for this argument, or for Clegg’s slightly more nuanced position. At this stage it’s unhelpful at best; at worst it’s pure mischief-making, driven by a determination to maintain the coalition with the Tories and keep the Lib Dems in government on that basis. Ironically, it also gives the Tories a strong incentive to attack the Lib Dems: every seat the Tories can take from them makes it more likely that the Tories will be the largest single party. As well as fetishising the largest single party (evidently on the assumption that the Tories will be that party), the right-wing press has denounced the possibility of a coalition between Labour and the SNP, arguing that this would be undesirable, illegitimate and inherently unstable – although, given the arithmetic, a Tory-led coalition is likely to be considerably more unstable. A simple and straightforward answer to both these charges would be to say that governments are formed on the basis of a majority in the House of Commons; that there is no clause barring members of the SNP, or any other elected party, from forming part of that majority; that the solidity of the SNP vote, and the congruence of Labour and SNP policies, make a Labour/SNP majority a virtual certainty; and that this is a good thing, guaranteeing that the new government would be both representative and stable. However, Labour politicians from Miliband on down have refused to say anything like this, insisting that the party is fighting for an overall majority – something which, on the basis of the current numbers, is implausible for the Tories and downright unbelievable for Labour. It’s Labour I want to concentrate on in this post. When it comes to allying with the SNP, Labour are in a difficult position. Given the distortions of the ‘first past the post’ system, support for the SNP has risen to the point that it effectively wipes out the other parties’ chances of electing any but a very few MPs in Scotland. A recent poll gave the Lib Dems 4% of support in Scotland, the Tories 15%, Labour 26% and the SNP 49%; on that basis (according to the UK Polling Report swingometer) the SNP would win 54 of the 59 Scottish seats (+48), Labour 4 (-37), the Lib Dems one (-10) and the Tories none (-1). Given that there were 40 Labour MPs in the outgoing House of Commons, this is an extraordinary turnaround – and one with serious implications for Labour’s position overall. Projections showing Labour taking 295 seats – a net gain of 39 from the current 256 – are actually showing a net gain of 76 English seats. It also helps explain a certain deafness on Labour’s part to friendly overtures from the SNP. Even if the two parties’ policy commitments were identical, for Labour to accept the SNP as a member of an anti-Tory alliance would be to abandon 36 MPs (the 37th was Eric Joyce). A revival of Labour in Scotland – assuming for the moment that this is a possibility – could also have game-changing effects for the House of Commons as a whole. If Labour were to wave a wand and take 10% of Scottish support from the SNP – taking the two parties’ support in Scotland to 36% and 39% respectively – this would only correspond to a 1% rise in UK-wide support, but its effects would be enormous: the largest party in Scotland would be Labour with 31 seats, followed by the SNP (24) and the Lib Dems and Tories, both on two seats. If this corresponded to a UK-wide increase in support from 35% to 36%, it would take Labour from 295 to 322 seats; an effective majority together with Plaid Cymru, never mind the SNP. There’s also the intriguing suggestion that the level of ‘undecideds’ is substantially higher in Scotland than in the UK overall, running at anything up to 28%. A Labour campaign which could engage with undecided Scottish voters to the extent of bringing Labour 15% out of that 28% and the SNP 10% – instead of 7% and 14%, reflecting the breakdown of the ‘decided’ vote – would take the vote split from 49%/26% to 45%/33%, giving Labour 17 seats. So, the best way for Scottish Labour to encourage its supporters to vote – and its activists to get the vote out – is to stick to the message that Labour cares about every seat in Scotland; it’s also an easy message to stick to, as it’s the truth. A post-election alliance with the SNP is feasible for Labour in a way that it isn’t for the Tories, and in the abstract this is a plus point for Labour; however, for as long as (Scottish) Labour is also the enemy the SNP has to defeat, (GB) Labour can’t make anything of it. To put it another way, it’s not surprising that Labour might have some difficulty welcoming SNP MPs into a broad progressive alliance, when we consider that two-thirds of those MPs will have been elected for the first time on May 7th, after defeating a sitting Labour MP. The implications of this position are greater than they seem, though. Labour could rule out a deal with the SNP then come to power as the head of a post-election anti-Tory alliance, formal or informal. If this looked like being a likely result – or the only likely alternative to a Tory victory – then the situation for Scottish voters would be exactly the same as if Labour were promising to ally with the SNP: there would be no reason to vote SNP rather than Labour, and all those Labour seats would be just as much at risk as they ever were. To make the party’s position credible, Labour has to make the further commitment not to ally with the SNP, even at the cost of losing power. “I heard Ed Miliband and he sounded awfully like he was saying – and I hope I’m wrong about this because I think people across Scotland and the rest of the UK would be appalled if I’m right – he sounded as if he was saying that he would rather see David Cameron and the Conservatives back in government than actually work with the SNP. ‘Other parties’ here meaning, primarily, the SNP. But – to follow that train of thought through – if Labour can’t get policies through without winning support from the SNP, and if the SNP has a lot of the same policies as Labour anyway, then there’s no reason on earth to vote Labour rather than SNP in a Labour/SNP marginal. What looks like wild irresponsibility may actually be the logical consequence of a commitment to fight for Labour votes in Labour seats. Labour’s apparent acquiescence in the other line being put forward by the Tories and their media allies – the idea that the largest single party has a right to rule – baffled me for a long time. Jim Murphy, leader of the Scottish Labour Party, has openly endorsed the ‘largest single party’ model, saying that a strong result for the SNP would directly benefit the Tories: “If this poll [giving the SNP all the seats in Scotland] is repeated on election day, David Cameron will be uncorking his champagne, because he might cling onto power; not because Scotland’s gone out and voted Tory, but because Scotland has voted against the Labour party and made sure David Cameron has the biggest party”. Perhaps the Scottish context is the key, and we’re still in the realm of costly signalling. If the next government could be formed by putting together an anti-Tory majority – as in fact it can, constitutionally speaking – then there would be no reason to try and save all those Labour seats, other than pure party loyalty. Therefore (for a politician in Murphy’s position) there must be some way in which losing Labour seats to the SNP would affect the outcome; the only significant difference the loss of those seats could make is that it might stop Labour being the largest single party; therefore, it must be the case that the largest single party wins. The cost is rather high – it involves not only lying about the British constitution but endorsing a lie put forward by David Cameron for his own ends – but the signal is sent loud and clear: vote Labour. Vote Labour or else. The problem is, of course, that the message sent to potential Labour voters in Scotland is entirely negative; it essentially says that the Scottish political battle (between two Left parties) has to be treated as if it were a battle between Left and Right, because the Labour leadership says so. We’re not in the world of “Tartan Tories” any more, but the effect is much the same. Could it be different – could Labour fight for those Scottish seats (and those undecided Scottish votes) without threatening to bring the roof down on us all? Could the nationalist parties be treated as friendly rivals rather than mortal enemies – fight for every vote on May 7th, shake hands on May 8th? Can it still be like that? I wonder; I worry. At the moment – three days out – I think there are three main possibilities, which unfortunately get worse in ascending order of probability. I think that would shoot several foxes & almost certainly make Miliband PM. Unfortunately I can’t see him doing it. I hope I’m wrong, though. 2. The Labour leadership may be thinking in terms of keeping their heads down until Thursday, fighting hard (and sending out costly signals), and then forming a minority government. In this case – as Sturgeon says – ruling out a deal may not make much practical difference. In a minority government the parliamentary arithmetic would be exactly the same as in a coalition – the government’s majority would just be re-assembled every time, generally from the same parties as the time before. This would have the additional advantage of disrupting the Tory/LD bloc by encouraging individual MPs – or entire parties – to support Labour legislation. This would be a hegemonic strategy, in other words, from a position of apparent weakness. I think this would appeal to Miliband on several levels. Murphy also indicated that Labour would resist pressure to vote down the Tories if David Cameron’s party became the largest in parliament. Murphy told Sturgeon the last time the losing party had formed a minority government was in 1924. “It was so long ago, there wasn’t a Queen’s speech. It was a king’s speech,” he said. Sturgeon retorted that Gordon Brown had tried to broker a deal to continue as prime minister despite coming second behind the Tories in 2010 – disproving Murphy’s thesis. But the Scottish Labour leader implied that the former prime minister was wrong, saying there was “an unstoppable force” behind the Tories which made it clear they were correct to form the government. Largest single party = “unstoppable force”? Labour would “resist pressure to vote down the Tories”? Either this is the madman theory in full effect, or Murphy actually believes it. I fear the latter possibility, and I fear that he’s not alone. I have a lot of trust in Ed Miliband’s judgment – he’s shown that he’s not someone to be underestimated – but we’re electing a party, not a president, and there are some Labour MPs I wouldn’t trust as far as I can throw them. I’m not giving names, both because it would be a distraction and, more importantly, because they don’t tend to use names – see for instance “some members of the shadow cabinet”, bravely disagreeing anonymously with their own party leader in the middle of an election campaign in today’s Murdoch Times (not that I’m cross about this or anything). If anyone in the Labour party is thinking along those lines – if anyone is thinking in terms of stepping graciously aside and giving the Tories another turn in government… well, there’s a quote for that. From the outset, Russia has advocated peaceful dialogue enabling Syrians to develop a compromise plan for their own future. We are not protecting the Syrian government, but international law. I would rather disagree with a case [Obama] made on American exceptionalism, stating that the United States’ policy is “what makes America different. It’s what makes us exceptional.” It is extremely dangerous to encourage people to see themselves as exceptional, whatever the motivation. There are big countries and small countries, rich and poor, those with long democratic traditions and those still finding their way to democracy. In passing, I was amused to see that this last glimpse of the blindingly obvious had annoyed Thomas Friedman. Who does this so-called President Putin think he is, making out that America isn’t the greatest goddamn country on earth? That there is “convincing evidence, generally accepted by the international community as a whole, of extreme humanitarian distress on a large scale, requiring immediate and urgent relief”; it is “objectively clear that there is no practicable alternative to the use of force if lives are to be saved”; and the proposed use of force is “proportionate to the aim of relief of humanitarian need”. Unless, of course, what the UK government was planning was to carry on bombing until every last chemical weapon in Syria had been put beyond use; we’ll never know. It’s probably just as well. Akande also made a broader point, which is that the idea of legality invoked by Grieve is rather a provisional thing. To the extent that it’s codified in any way, international law provides for military action in self-defence, in accordance with a UN Security Council resolution and, er, that’s it. What Grieve is referring to is the informal or ‘customary’ international law which is constituted from year to year by what states actually do. The BBC canvassed opinions from Akande and four other lawyers (Geoffrey Robertson QC, Professor Sigrun Skogly, Professor Robert McCorquodale and Professor Dr Wolff Heintschel von Heinegg) as well as the political analysts Dmitry Babich and Sinan Ulgen. Their views stacked up as follows. There were five key issues: the role of the UN, including but not limited to the UN Security Council; the legality of “humanitarian” interventions; the legality of past interventions in Iraq and Kosovo; the “responsibility to protect” doctrine in the case of crimes against humanity; and the appropriate response to breaches of the ban on chemical weapons. ROBERTSON: Intervention to prevent crimes against humanity – such as the use of banned chemical weapons – does not require UN Security Council approval; the legality of humanitarian intervention was established even before the UN was founded, in the context of actions against piracy and slavery. The intervention in Kosovo was not condemned by the UN Security Council, making it legitimate. SKOGLY: Normally, any intervention needs to be approved by the UN Security Council. However, the legality of humanitarian intervention is a separate question. UN member states have a duty to promote human rights; consequently, if the regime has used chemical weapons, they have committed crimes against humanity. This means that UN member states are obliged to act on the basis of the responsibility to protect. McCORQUODALE: Military action must be approved by the UN Security Council; failure to gain this approval means that the Iraq intervention is considered illegal. Intervention for humanitarian reasons, or on the basis of the responsibility to protect, is not lawful in terms of international law, although it may be in future. AKANDE: The principle of responsibility to protect “does not create a legal right for intervention without Security Council approval”. The doctrine of humanitarian intervention rest on “a view of international law that has been rejected by most states”. (The humanitarian intervention in Kosovo, while not approved by the UN Security Council, was in pursuit of demands made by the UNSC.) A General Assembly resolution might be a possibility, but permanent members of the UNSC are unlikely to offer the GA that kind of authority. HEINTSCHEL VON HEINEGG: In the absence of a UN Security Council resolution, intervention could only be justified on the basis of “customary international law”. The US and allies acted on this basis in their humanitarian intervention in Kosovo, although many states still regard this intervention as illegal. International treaties outlaw chemical weapons but do not provide for military intervention in response to their use. Some states currently turn a blind eye to limited action against chemical weapons, but this may change. BABICH: Although the US might cite chemical weapons as a justification, UN Security Council approval is essential to make any intervention legal. Iraq and Kosovo didn’t have UN approval and were therefore illegal. And let’s not forget that they never found any chemical weapons in Iraq. ULGEN: Only action approved by the UN Security Council would have “full legitimacy”. An alternative would be to try to get a resolution passed by the General Assembly. Other possibilities, outside the UN framework, include the responsibility to protect principle (invoked successfully in Kosovo) and international law banning chemical weapons, going back to the 1925 Geneva Convention. So what does that lot add up to? For McCorquodale, Akande and Heintschel von Heinegg (three of the five lawyers), as well as Babich, the lack of UN approval makes intervention illegal. At the same time, all three lawyers acknowledge that international law changes over time and that customary international law may, arguably, give support to actions which are formally illegal. In this respect they contrast the Syrian situation unfavourably with Kosovo, although it’s a question of degree: none of them goes so far as to assert that the Kosovo intervention was legal. They also note, as does Babich, that customary international law is contested: one state’s customary international law may be another state’s illegal aggression. Robertson dismisses the idea that UN approval is needed before military action can be taken. He argues that humanitarian intervention is legitimate, and that it’s legal under international law unless and until it’s ruled to have been illegal. Robertson’s invocation of piracy in this context is odd; action against piracy was justified historically on the basis that pirates were hostes humani generis, enemies of mankind and outside the protection of any nation. Robertson also refers to slavery, which seems more relevant: British actions in suppressing the slave trade – such as detaining slave ships and offering the slaves their freedom – could certainly be seen as outside the law, and did cause international incidents. However, these were at worst acts of unlawful expropriation, for which the slaveowners and their governments could (and did) ask for redress. Any parallel with the proposal to ‘free’ the people of Syria from the use of chemical weapons through outright acts of war is stretched in the extreme. Skogly and Ulgen both argue that the responsibility to protect could justify intervention, although Ulgen does acknowledge that this would be outside the UN framework. Skogly goes so far as to argue that “responsibility to protect” makes intervention obligatory, although she avoids stating outright that it would be legal. Having picked my way through all these different opinions, I think things ultimately are as simple as Babich makes them seem. The putative legal justification for an intervention has been variously rested on the 1925 Geneva Protocal banning chemical weapons (which doesn’t justify intervention), on the doctrine of preventing crimes against humanity (which is purely customary) or on the ‘responsibility to protect’ (which is codified, but doesn’t justify intervention outside the UN Security Council framework). In short, there’s nothing there, unless you define ‘international law’ as ‘what states do and then claim to be legal’ – and that’s not really satisfactory if the reason you’re invoking international law is to justify your state doing something and then claiming it to be legal. In this ‘customary’ perspective, international law (like reality) really is “what you can get away with“. This approach may work for a while if, like the USA, you’re one of those states that tends to get away with things (Britain historically isn’t, to its credit). But it’s not a principle that could ever coherently be generalised – which may be why, as Akande says, most states don’t want it to be. Remove this impossible option – of a kind of informal international legal order built on generalised lawlessness – and we’re left, as Putin effectively said, with a choice between international law and exceptionalism: either the law applies to everyone, or we maintain that it doesn’t apply to us because we say so. This isn’t to say that there will never be an international mechanism for intervention in cases of humanitarian crisis, or that the ‘responsibility to protect’ will always be subject to agreement at the level of the UN Security Council. International law can and does change. But it hasn’t changed yet – not in the way that the interventionists would have liked. I think the failure (legal as well as political) of the arguments for intervention is significant – and very welcome, if that doesn’t go without saying. It should, hopefully, set an enduring precedent. a system of law that would countenance mass atrocity without any remedy simply because the interests of a veto-wielding power at the UN blocks remedial action is morally unacceptable, indeed intolerable; and so where the UN itself becomes delinquent by not upholding some of its own most fundamental principles, the UN not only may, it should, be defied by member states willing to give those principles more respect. Viewed from the angle of UN legality, military action against Assad cannot possibly be legal … If military action against Assad is morally justified then that must be the case regardless of whether or not it is ‘legal’. Pace James B, if military action against Assad (or anyone else) is illegal, that must be the case regardless of whether or not it’s morally justified – or, to put it another way, regardless of how much we may want it to be legal. And if you’re going to use your moral justification to knock a hole in the – already horribly imperfect – edifice of actually existing international law, it’s going to need to be a very good moral justification. Which brings me to the second point, touched on by Akande. Politically, the great merit of a rush to war is that it gets you into the war nice and quickly, without too much time to sit around debating the whys and wherefores. Conversely, one of the great merits of insisting on legality – at least, insisting on stopping for long enough to have the argument about legality – is that it creates a pause in the rush to war, in which there’s time to ask the awkward questions: in particular, what is the government trying to achieve, and has it chosen the best means to do it? Fortunately – and thanks to some excellent political footwork from Ed Miliband – there’s been a long enough pause for those questions to be asked; I think it’s fairly widely acknowledged now that the UK (and US) government’s goal was all too unclear, and the means chosen seemed likely to be horribly counter-productive. But it was a close thing. Too often, when the drums start beating, the appropriateness of military force goes unquestioned, even by people who position themselves on the Left. But if all your solutions look like craters, I think you need to ask yourself why you believe that all your tools are missiles. Those who fear solidarity’s exclusionary tendencies generally focus on the solidarities based on our past, that is, on our inherited situations of race, language, culture, and religion. Those who proclaim its benefits see solidarity in terms of our working with others to achieve common solutions to common problems such as global warming. 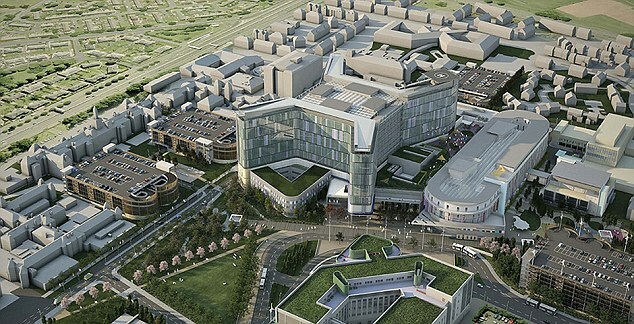 Here the focus is on what we want to achieve politically, that is, on the future that we seek to collectively realise. Identity in this instance is not a matter of what the past gives us, but is rather provided by our working with others for a common goal. This identity is political rather than natural. … Being a member of a state with its universal rights and political obligations, that is, being a citizen as opposed to a member of a racial or linguistic group is sufficient for this type of identity. No one, of course, lives completely in the past or the future. Thus, our identities (and corresponding senses of solidarity) are never so neatly defined. Our collective actions are informed by the past. Without it, we have no experiential or moral basis for acting. But they are also determined by the future, that is, by the goals that we want to achieve. Once you have acknowledged particularity or diversity, and postulated that their forms provide the ‘checks and balances’ to the possibility of exclusionary violence rooted in past divisions, there is nowhere to go. Mainly because trying to go anywhere else would be too risky: reasoning about the general interest that unites all the particular interests risks doing violence to some of the particulars. The problem is that refusing to go this extra step towards the idea of a general interest automatically does violence to the particulars: by freezing them as abstract particularities, it denies them a transformative future … Only by attempting to articulate what actually unites particular forms of identity in a political project can they have a future. Nationalism, as a form of solidarity, is therefore not always regressive. Richard Phillips writes in this month’s issue of Planet magazine … that the resurgence of Scottish and Welsh nationalism can represent not the desire to tear loose from the UK a residuum of ethnic and lingustic identity, but a path towards a new internationalism. … Solidarity is once again an attempt to challenge the social totality, to build a genuinely international community, based on the unhealed divisions within the nation-state, based on the legacy of colonialism, based on the continued triumph of those who have always written history. In the form of the abstract particular (linguistic identity, the legalistic promotion of Welsh etc. ), this new nationalism risks becoming another tool by which political elites retain their hold on power, and closing off the future. But national self-determination also generates a new enthusiasm for returning to the basic political question: how do we want to live? I was pleased to see that last paragraph, as by the time I reached “automatically does violence to the particulars” I was flashing back to a book review I wrote a few years ago that, uncouthly, backed ethnic nationalism over civic ditto. (It was partly a Michael Ignatieff thing; if he’s for it I’m usually against.) And by the time I got to that last sentence I was already thinking, this is why I’m still interested in Welsh nationalism, and why Irish blogs like Splintered and Cedar Lounge seem so important – revolutionary socialism is always partly utopian, but when you’re trying to build a new nation you have to think about how people are actually going to live together. But I guess you’ll have to take my word for that part. Great minds, anyway. And here’s that review, which appeared in the May 2000 issue of Red Pepper. I was quite surprised with how the argument turned out – not unpleasantly, though. This consensus hides an unresolved contradiction between ‘ethnic’ and ‘civic’ nationalism. Ignatieff endorses the desire of “the subjugated minority” for a nation state, only to argue that “civic contractualism is the only possible basis for … national solidarity and social cohesion”. Presumably once this is achieved minorities have no need for full-blown ethnic nationalism: if your nation’s governed by the right kind of state, the most you can aim for is civic-minded reformism and the celebration of cultural diversity. There is a whiff of the End of History about this. Other contributors are more sceptical. Olivier Roy stresses the plural nature of ‘ethnic’ identity, which operates at national, sub-national and supra-national levels: the same person may identify as a French Algerian, a Kabyle, an Arab or a Muslim. Africanist Terence Ranger presents evidence suggesting that ‘ethnicity’ itself is a relatively recent invention. On the other side of the equation, Fine queries the merits of state nationalism: “Civic nationalism offers … an emotive source of political cohesion … But it also engenders faith in the state rather than critical reflection, and a sidelining of social questions”. This recalls MacCormick’s formulation, prompting the question of how national identity relates to such other “significant contexts” as gender, sexual orientation or (whisper it) class. Notably, Fine is also the only contributor to ask what liberal nationalism has to offer “the homeless pariah who refuses, or is refused, participation in national communities”. Many of the arguments here seem tailored to the more clear-cut ‘national questions’ – Türk’s Slovenia, say, or MacCormick’s Scotland. Harder cases – Kosovar Albanians, the Romani minority of Kosova, Kosovar Romani asylum-seekers in Britain – would require a deeper analysis of culture, rights and power. This might start by treating ‘ethnic’ self-assertion as a positive value rather than a malign throwback, complementing it not with the liberal self-congratulation of ‘civic nationalism’ but with the fundamental humanist demands of democracy and social justice – demands which know no country and have no end.